Home › Advice › How often should you check your mirrors? At 100km/h you’re travelling almost 28 metres a second. In five seconds you’ve travelled almost 140 metres. The landscape has changed, you’ve been past intersections, other vehicles have changed lanes. Would that be a good time to check your mirrors, every 140 metres? Many advanced driving instructors say that you should quickly glance at all three mirrors (rearview, left wing mirror and right mirror) every five to eight seconds. A glance isn’t ‘studying’ what’s in the mirror; it’s more a quick check that nothing untoward is happening. 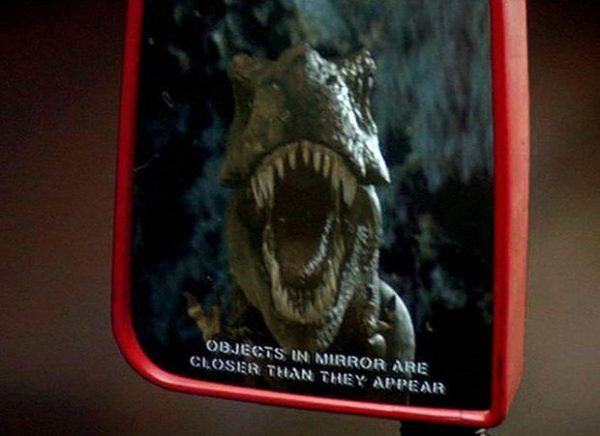 If you spend too long looking in your mirror you’re not looking ahead and that could mean you miss a developing hazard and cause an accident. Of course, you will always be checking your mirror every time you indicate to change lanes or make a turn, just before you turn and just after you turn, before you slow down, before you move away from the kerb and to check your makeup is looking fierce (just kidding about the last one). Glancing every five seconds or so gives you a really good mental map of what’s going on around you and means that if you need to change lanes quickly to avoid something that falls off a vehicle in front, you’ll have a very good idea whether there’s a vehicle next to you before you even have to look. You’ll also be aware of vehicles that were there but now mysteriously aren’t (are they in your blind spot, in which case you should be careful). If you are stopped at the end of a queue of traffic you should check your mirrors as vehicles approach you from behind so that you can ensure they’ve seen that you are stopped and are slowing down; the last thing you want is a nasty surprise as another vehicle smashes into you from behind. If you are travelling below the speed limit, other vehicles will be catching you up. At 70km/h, other vehicles travelling at 100km/h are catching up with you by 40 metres every 5 seconds. Checking your mirrors on the motorway will enable you to see motorbikes filtering through the traffic, and the same applies to cyclists when you’re on busy urban routes. If you think five seconds is too frequently, then at minimum you should be glancing in your mirrors every 8 seconds. Experts recommend every 5-8 seconds. The other reason for this is our short-term memory which is shockingly bad the majority of the time. Most drivers won’t remember what they saw in their mirrors just 5 seconds after looking, mainly because they are also focusing on so many other things, so checking frequently tops up your memory of the surrounding traffic. To be sure that you are effectively checking your mirrors you need to be able to set up your car mirrors correctly.